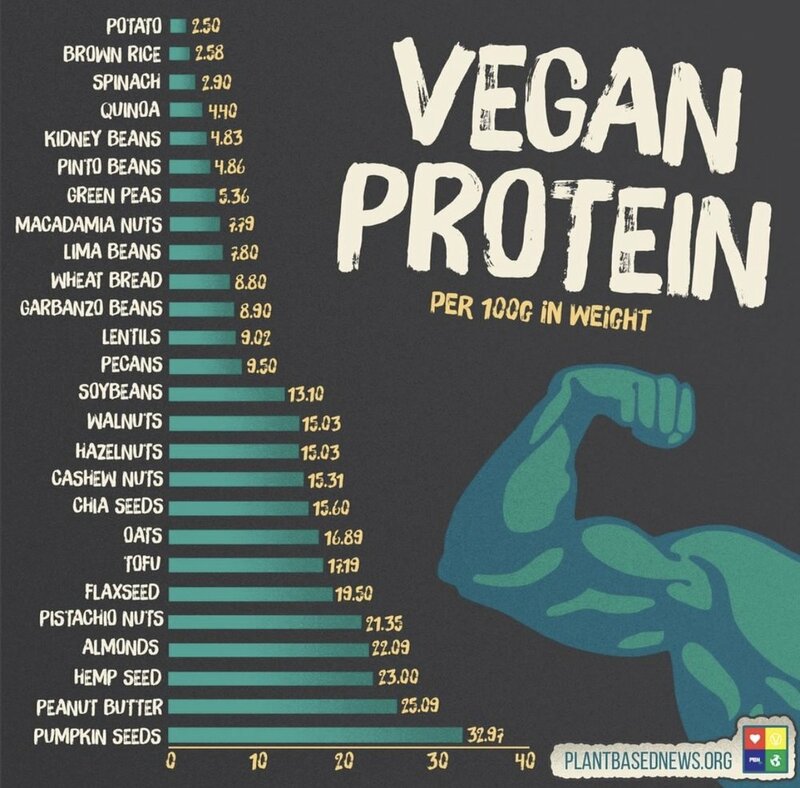 All protein are made by plants. It’s not necessary to eat animal tissue to get protein. The primary source of protein comes from plants, the protein you get from animal products is simply recycled plant protein. Only plants have the ability to take nitrogen from the air, break these molecules in parts and incorporate the nitrogen into amino-acids to make protein. - Sedentary adult 0.4 g of protein per pound. - Active adult 0.4-0.6 g of protein per pound. - Growing athlete 0.6-0.9 g of protein per pound. - Adult building muscle mass 0.6-0.9 g of protein per pound. Plant-based nutrition has all the amino-acid essentials you need and the daily amount of protein recommended. For a 150 pound male triathlete I would recommend 0.6 for a total of 90 grams of protein per day. This one week high protein vegan meal plan is composed with 3 meals, and the daily average of protein is superior to 80 g of protein. With 2 to 3 collations , you can increase easily your daily intake over 100 g of protein, and this is largely enough. Grains, beans, and vegetables have plenty of protein to cover the daily needs of protein. The largest, strongest terrestrial animals on the planet are herbivores and frugivores. It’s very important to get your protein form plants because plants have much more beneficial effects on our physiology and heart. A plant-based diet doesn’t create inflammation, it is alkaline and is filled with fiber. At the same time a single meal with meat, dairy, and eggs triggers an inflammatory reaction inside the body within hours of consumption. In this routine, we may be stuck in a chronic low-grade inflammation danger zone for most of our lives. This can set us up for inflammatory diseases such as heart disease, diabetes, and certain cancers. What exactly is causing the meat-induced inflammation? Inflammation is an immune response to a perceived threat, but what’s the body attacking? After a meal of animal products one’s bloodstream becomes soiled with bacterial toxins known as endotoxins. The level of endotoxins in the bloodstream induce inflammation. When the body is under inflammatory stress, the liver focuses on producing inflammatory proteins, like cytokines, rather than albumin, this is why albumin decreases with inflammation. Albumin performs many functions including maintaining the “osmotic pressure” that causes fluid to remain within the blood stream instead of leaking out into the tissues. Albumin also acts as a transport vessel. The albumin in your blood moves the mineral calcium, hormones and medicines throughout your tissues. A low level of Albumin will low intravascular fluid volumes vital to effective circulation of blood and oxygenation of tissues. The transport of nutrients “like protein”,hormones and different substances will be perturb and the digestive system will not performed correctly. The primary source of protein comes from plants. Plants have no inflammatory response, no saturate fat and cholesterol. Plants bring all the amino-acid essential you need and the daily amount of protein recommend in an alkaline environment.